I had a request for this recipe from Twitter (thanks Lauren!) The only thing I might have changed is to add a flax egg or flour or some kind of binding agent to the potatoes to make them firm up when cooked. As is common, the leftovers were better and it tasted great all mixed up! Preheat oven to 400. Toss veggies (through tomatoes) with copious taco seasoning and oil of choice if you eat added oils. Spread veggies on a cookie sheet and roast 30 minutes or until they are tender. Mix the warm veggies with the frozen spinach and pinto beans when they are done roasting. While the veggies are roasted, peel your sweet potatoes and put them in a pot of salted water. Boil until ready to be mashed. 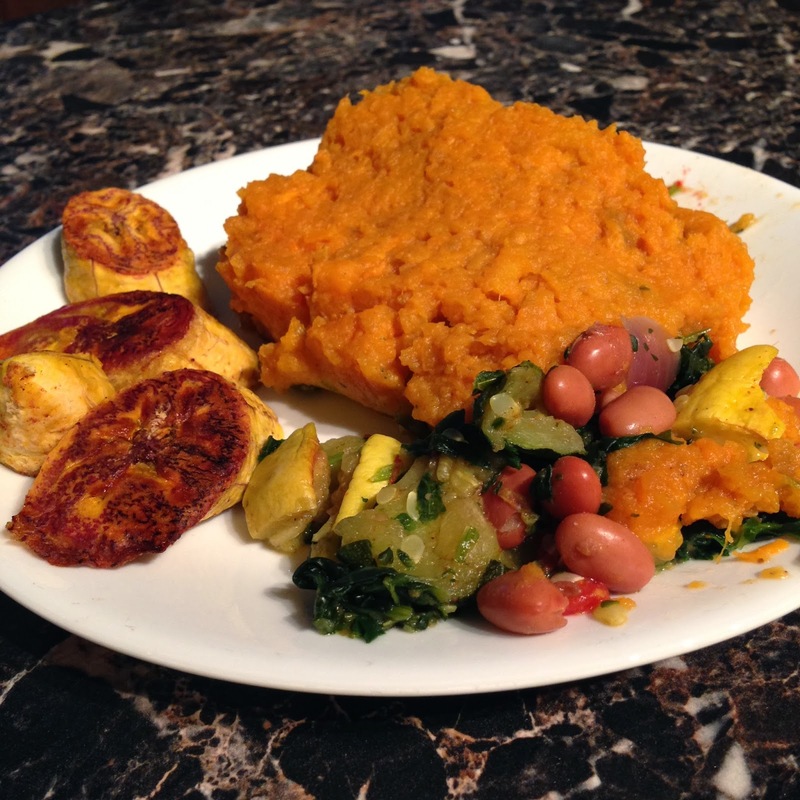 Mash the sweet potato and add more seasoning to taste. We didn’t add anything else to the potatoes, but as I mentioned before you may want to add milk and binder of choice here. Spread the veggies in a 13x9 baking dish (you may not be able to fit them all). Top with sweet potato mash. This can sit overnight if needed. Bake at 350 degrees: if the veggies are still warm it should take about 20 minutes, if they are cold from the fridge it will take closer to an hour. Garnish slices with hot sauce, scallions, cilantro, avocado, etc.